Since my last post, I am proud to say that I no longer have the acrylic overlays and am rockin' my own natural nails! Yay!! That doesn't mean I am not missing my solar tips though. Ha ha! I am getting used to having to do my own nails each week, and also trying to take it easy on them being they no longer have the artificial strength they are used to! The ridges in my nails are growing out and are about 1/4 from my cuticle line. I found an amazing filler by Essie called Fill The Gap. It gives my nails an even surface to paint by filling the ridges. It also works as a nice base coat. This week, I used Fill The Gap as a base and filler, Sally Hansen's Diamond Strength No Chip Nail Color in Lavender Marquis, then topped it off with Wet N Wild's Mega Last Quick Dry/Ultra Gloss Top Coat. The nail color really is "no chip" - I didn't have any issues with it and it looked great at the end of the week. The top coat is AMAZING! 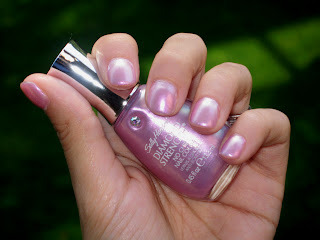 It sets the polish nicely, dries quickly and adds a gorgeous shine. Plus, it is cheap ... under $2! April, your nails looks great!